Throughout January our SuitePreps section will be rolling out profiles for some of the top football recruits in Massachusetts, all leading up to National Signing Day on February 4th. 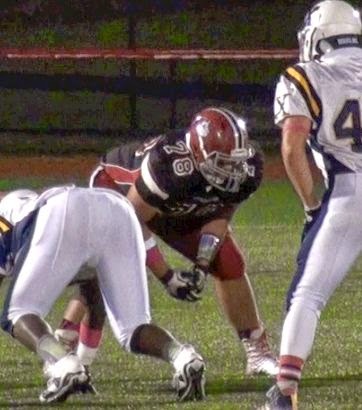 We continue our rundown today with beastly Brockton lineman Aaron Monteiro. Monteiro was one of the state's most feared two-way players, and with good reason. Lining up at both guard and tackle on offense, the Boxer ground game often followed him, whether he was straight drive blocking, or puling around to clear the way. It was as a pulling guard that Monteiro's unexpected athleticism really came through. The big 300+ pounder looked nimble pulling across the formation and pancaking play side defensive ends on counters and traps. Defensively, it was borderline impossible to block Monteiro with one guy, and even double teams often failed to do the trick when the big man was dialed in. When focused, Monteiro battled through double teams and slipped down blocks into the backfield with a mean streak you don't often see at the high school level. That brings us to his one weakness, conditioning. Monteiro is actually pretty well conditioned for a high school two-way lineman, but he did so much for Brockton that he would often be spent at the end of games. That would lead to lapses in technique, including standing up immediately out of his stance on both sides of the ball, and showing less aggression on defense. Monteiro will likely find a home on offense at Boston College, but conditioning will still be an issue if he hopes to be a starter at some point for the Eagles. A year of college-level lifting and conditioning should do the trick. On the whole, Monteiro's unique combination of size, strength and surprising athleticism gives him, perhaps, the highest ceiling of any player in Massachusetts' Class of 2015. Whether he realizes that potential or not will depend on him getting into the best shape of his life and playing with the mean streak he showed at times this season.